BOOK YOUR APPOINTMENT HERE TO SAVE $$$ :) You will not be charged at time of booking when making appointment. This is not a relaxing type massage like Thai oil Massage as it focuses on problem areas (upper body or lower body) and strong pressure is applied to remove knots etc. People can be slightly sore, have tenderness, or slight bruising for a few days afterwards. For relaxation- please see Thai Oil Massage. An ultimate experience combining magical powers of amethyst and infrared sauna technology with the touch of massage resulting in a tranquil massage for the mind and body. Infrared massage is the best of both worlds combined! 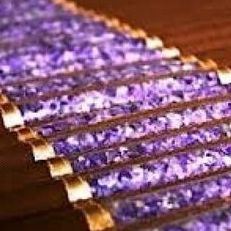 You receive the benefits of a Traditional Thai acupressure and deep tissue massage mixed with the benefits of an infrared sauna and negative ions at the same time while you lay on a bed of pure heated amethyst based upon Thai Sen Lines . We are the ONLY ones in town offering this massage. This massage is meant to focus on certain problem areas to relieve knots and pains.. This is a deep tissue acupressure massage using hands and sometimes tools. Always speak up if you feel any discomfort due to the pressure applied. Also please drink lots of water afterwards to flush out toxins and lactic acid to prevent possible soreness the next day. The soreness and any possible bruising should subside in a few days. Please keep all underwear on. Can also be done with light clothing on. Examples of problem areas: sore shoulders, upper or lower back problems, neck tension, leg problems. The BioMat offers spectacular whole body support. The synergistic effect of Infrared, Negative Ions and Amethyst Crystals working together, exponentially enhances their individual therapeutic benefits. Amethyst has come to be known as a power crystal with prolific healing powers that can be characterized as purifying, pacifying and transitional. Amethyst as a healing stone or crystal contains sobering and calming qualities and is used to treat and heal problems involving the central nervous system.